I can proudly say that is known as an International Baccalaureate World School and is a registered centre for the Cambridge International exams. It is a member of the International Montessori Council and holds the prestigious British Council Award. It is one of the best schools in the country for a child to pursue studies. With 13 years of International and IB experience in countries like Thailand, China, Indonesia and India and three successful IB accreditations, I feel privileged and honoured to be a part of as an Academic Coordinator. There is no greater calling than to be a part of a profession which requires me to concentrate on the overall academic development of a child from Kindergarten to Grade 12. I take the opportunity to share my thoughts about the school and the growth of academics in the recent years. 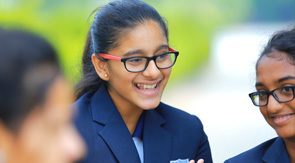 At Manchester International School , academic studies are concept and inquiry driven which prepares students to face any challenges, become positive members of the society and responsible global citizens. As an IB school, Manchester International School encourages holistic education through communal, physical, emotional and cultural well being thus establishing a base for constant learning. International and intercultural understanding is developed through the study of a variety of topics, regular field trips, guest lectures, outdoor study and practical learning are encouraged to make real life connections between the topic of study and the worlds around. Students here are empowered and encouraged to become responsible and respectful towards themselves, their learning, fellow individuals and environment in attitude and actions. They strive to become leaders of their own learning and as a result take action. Action day is one of the highlights of the school which portrays amazing transformations that takes place within the students. This day is organized for students to showcase their talents and skills, through a variety of academic related activities like Performances, Displays, Exhibitions and much more. Learning is sometimes delightful fun. We should not forget that it is often hard work, as well. This day gives a chance for us to recognize our children’s commitment and hard work as learners. Rigorous international programs taught at the school ensure to develop students’ emotional, physical and intellectual characteristics. Dedicated & motivated faculty members guarantee the overall growth of the students making them a well balanced human being. To ensure this, I conduct teachers training sessions and seminars from time to time on topics like differentiated instructions, assessment procedures, inquiry based approach and integrated Language learning. Other sessions which are given importance and organized by the school includes Jolly Phonics training, CIE subject specific training, IB in-school & regional workshops, other IB school visits and participation in job alike sessions by visiting different cities. The focus of the school is not only on academics but also to develop the child holistically. For this, students are encouraged to be a part of different activities like Dance, Music, Drama and sports. Various competitions such as debates and elocutions help students enhance their leadership qualities and oratory skills. Student council ensures that all students are involved in the affairs of the school, working in partnership with school management, staff and parents for the benefit of the school and its students. Academics can never be complete without the involvement of Parents. Manchester International School believes parents to be equal partners in a child’s education. The school has a wonderful and enthusiastic Parent body who are always ready to promote different activities for the development of the children. I can wholeheartedly say that Manchester International School offers world class quality schooling in the city which all the students will signify in their lives. "Absolutely would recommend MIS and do!! Teachers are excellent and involved, and we are particularly happy with the wonderful coordinators, Ms Kavitha and Ms Sapna. Can't say how happy we are to have moved our kids to MIS! It has been a very positive experience in every way. I am so happy that our kids are in the best international school of south India. "